Would you like to feel more energetic and powerful? One of my favorite things to do when I teach a yoga class is to ask my students to close their eyes, sense the quality of their energy and then show it to me with a hand gesture. As they sit there with their eyes closed, their hands begin to move in such a wide variety of ways – no two students’ ever look the same. Some trace a shape of a smooth, even wave, others show miniature explosions, some gestures look sporadic and jittery, still others appear to be flat-lining. Usually we do not spend much time during the day paying attention to the quality of our energy, yet it colors every single thing we do and the way we feel within our bodies and about the outside world. And when we talk about energy management in our yoga practice, it is not just about bringing the energy up or decompressing, but about making your energy more potent and smooth flowing. “In the ocean there are huge waves, like mountains, then smaller waves, and still smaller, down to the little bubbles; but back of all these is the infinite ocean. The ocean is connected with the bubble at one end, and with the huge wave at the other end. One man may be a gigantic wave, and another a little bubble, but each is connected with that infinite ocean of energy which is the common birthright of every being that exists. Wherever there is life, the storehouse of infinite energy is behind it.” So if you are feeling depleted, disconnected or jaded, through Pranayama you can replenish your resources and reconnect to that ultimate source of energy. While this goal sounds appealing, the process of getting there might seem daunting. Will you need to sit in a cave for years on end doing precise breathing techniques to cultivate your energy? Surprisingly, even yogis did not encourage it. The ancients believed that between the ages of about 20 and about 60 most of us reside in the “householder” stage of life, which means that we are busy with our families, careers and responsibilities. To handle this heavy load with grace and resilience and without compromising our health, we need to learn how to manage our energy through our yoga practice. That is why Pranayama with its life force expansion is so important to all of us. And when it comes to Pranayama, once again, consistency is more important than the length of the practice. 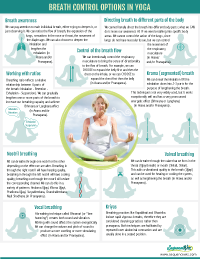 Generally speaking, it is enough to do at least 12 breaths of a specific Pranayama technique for it to have an effect. 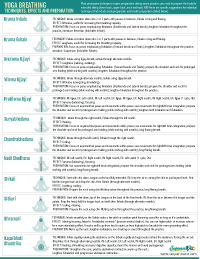 Here is a comprehensive list of Pranayama techniques that you can use to begin cultivating, controlling and guiding your Prana. But it is also useful to prepare your body for sitting and your breath for the Pranayama technique to get a better result. Next week we will outline the basic steps it takes to create a short potent yoga practice for energy management – tune in! It also includes Yoga Breathing: Techniques, Effects and Preparation handout with suggestions on how to prepare the body and breath for each individual technique. Great topic. Wonderful article and very timely for my own practice! Thank you for everything you do. Namaste.